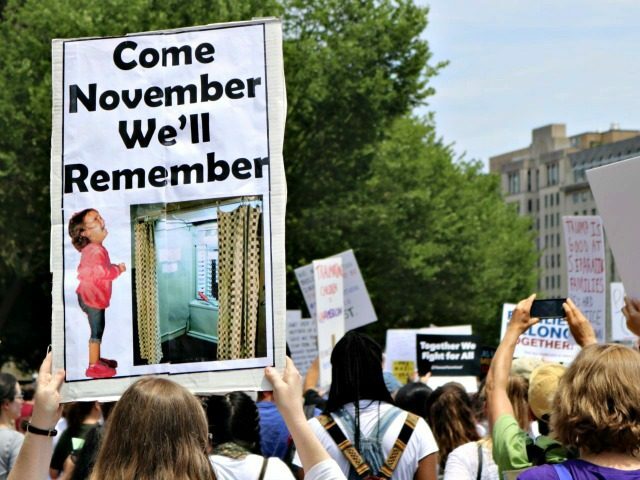 “Vote them out” chants rang out many times over the course of several hours at one of many leftist open borders protests on Saturday. The “Keep Families Together” protests rallied people under the brand “Families Belong Together,” targeting children separated from adults at the U.S. southern border when those groups cross illegally over the border. The call to “vote them out” was one of several themes observed at the D.C. location on Saturday. It was echoed in many of the signs held high over the crowd. 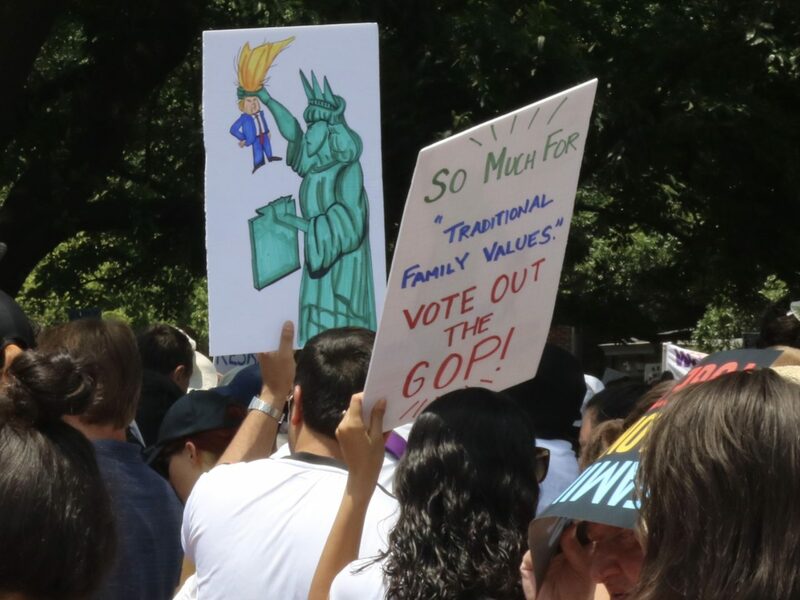 “So much for traditional family values, vote out the GOP!” read one of the signs that swung high near another with an image of the Statue of Liberty holding President Donald Trump by the hair in the same hand as her torch. 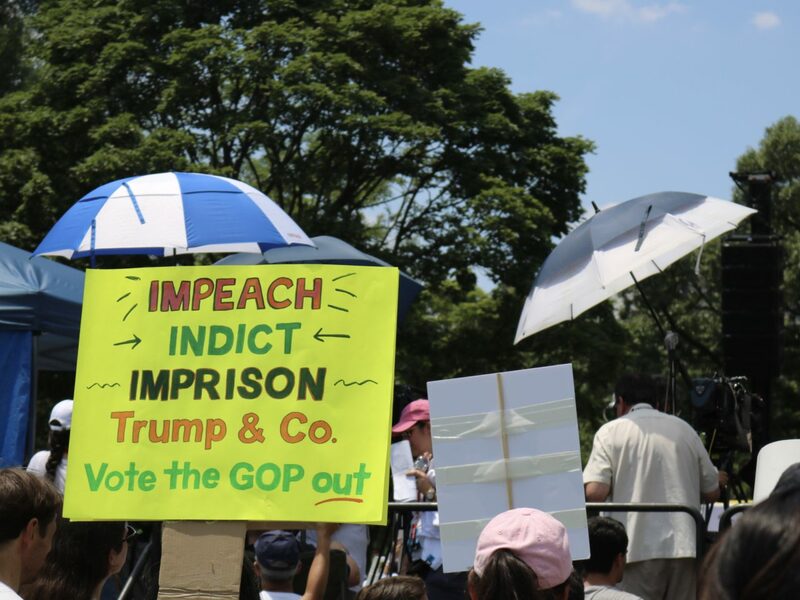 “Impeach, indict, imprison, Trump & Co. Vote the GOP out,” read another. “Come November we’ll remember,” read a sign with what appeared to be the same photo of a little girl not separated from her mother that appeared on the cover of TIME magazine. 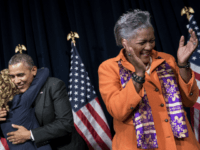 Next to the image of the little girl was the image of a voting booth. One group of protesters held printed signs marked by the National LGBTQ Task Force. “Stop detention and deportation of LGBTQ immigrants,” read one of their signs. “Dismantle white supremacy,” read another. Leftist groups the Answer Coalition and National Nurses United were represented as signs bearing their branding were raised high. Chants of “shame” arose often during speeches given at the main location for the event. 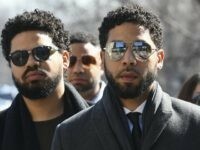 Chants were directed toward the Trump administration, Republicans, and the U.S. Immigration and Customs Enforcement.